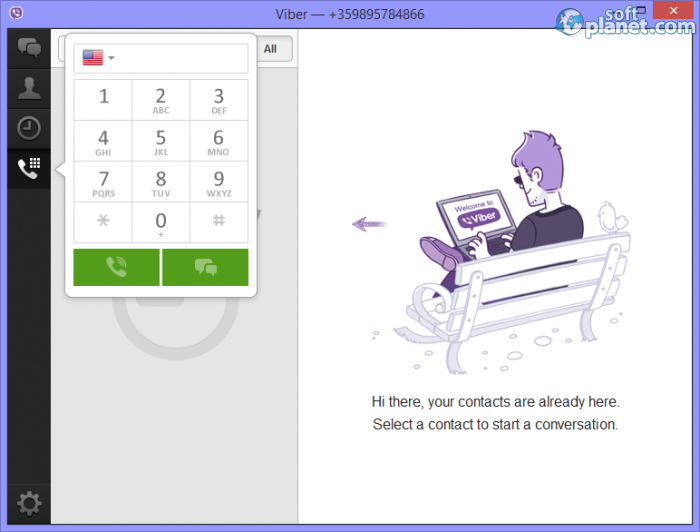 SoftPlanet makes it possible for everyone to get free Viber download directly from our servers. There is no registration needed for downloading. 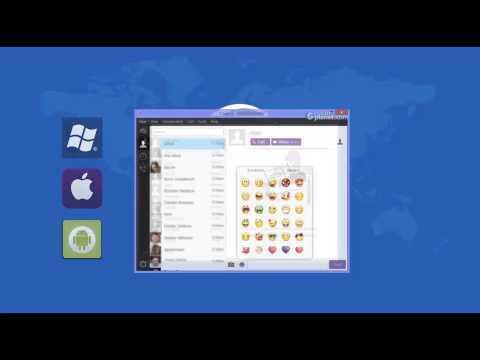 Viber 5.4.0.1664 for Windows is an application which allows you to get in touch with your friends who are using the same service. Any user who has downloaded and installed Viber on any of the devices he/she has can send free messages and make free calls. This program works with any network in any country. It can sync all your contacts from your cell phone with your PC. This way it does not matter from which device you will use it. 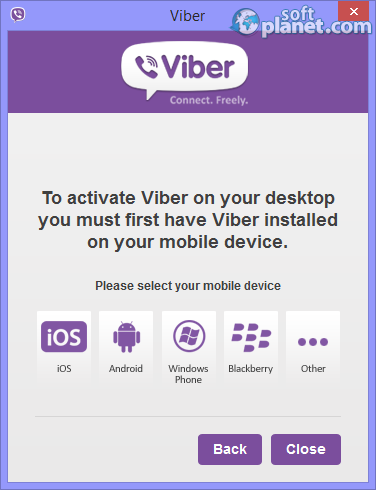 Viber is compatible with the most of the worldwide devices which use Windows, iOS and Android as well, as Windows Phone, BlackBerry, Bada and Nokia. Unfortunately not all older phone OS platforms are supported. Viber offers free audio and video calls, free text and photo messages, group conversations and all this without any obligations. Cross platform communication is probably one of its best features. Viber's interface looks very similar to any of the popular chat client interfaces. The top row is preserved for the program menus, while the left side edge is occupied by the task bar. There is a Search window for a quick contacts search. All the phone contacts are listed in an ascending order. Users can also see the contacts' photos if there are any. The program settings can be reached from the Tools menu or by the lower left edge icon. By clicking on any of the Viber contacts listed on the left you open the communication window. There on top you can click on the Call or Video buttons to engage in the type of communication you want. Emotion and Sticker icons can be inserted using the button at the bottom. The photo button which you can use to take whatever photo you want and then send it is next to it. From the task bar on the left all the recent conversations can be visualized as well as the contacts and the dial pad. 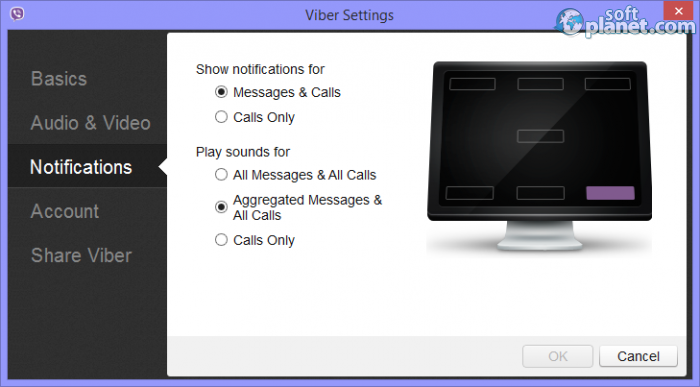 The idea of creating a program like Viber 5.4.0.1664 is very good. We were really fascinated by the application because it is free, light on resources, easy to use, user-friendly, and it even does not require you to register. Another major plus is that it works with any cell phone network. But to truly find out if you like Viber you have to try it first. Our security scan shows that Viber is clean from viruses. The current version of Viber has been scanned by our system, which contains 46 different anti-virus algorithms. That ensures that Viber 5.4.0.1664 is 100% safe for your computer.